Macaroon Fail? Never fear, Macaroon Mess is here! I must have made hundreds of Macaroons by now. I’ve even taken a night class to learn their secrets. But they are tricky, fickle things and even now probably two thirds end up in the reject pile. They still taste great of course but maybe they are cracked or have peaks or horror of horrors not passed that number one macaroon test – no feet! So I end up with tins full of macaroons that eventually go stale and get thrown out. Seemed like an awful waste. While prepping for our latest party I had a brain wave – the Macaroons taste great, look pretty why not create a twist on an old classic – instead of Eton Mess why not Macaroon Mess. Now someone may have come up with this before but if they haven’t I hear by coin it! If you’re not familiar with Eton Mess it’s a heavenly mix of crushed meringue, strawberries and cream. Another one of those serendipitous happy accidents like brownies that have found their way into our most favourite recipes. How do you create a Macaroon Mess? Part of the beauty of the dish is it’s really easy and if you have a great clear glass trifle bowl it will look spectacular. It’s simply a matter of layering. Starting with cream, sweetened with sugar and essence, either vanilla or an appropriate flavour for you other ingredients, add a layer to the bottom of your bowl. Next some fruit. This mess was for a “Twisting by the Pool” baby shower. Our colour theme was blues, greens and a punch of yellow for an accent. So I picked fruit that fit that theme. I used a mix of fresh and canned pineapple and folded lemon curd through the juice to thicken it and balance the sweetness. You could use a berry compote or stone fruit but make sure they are thickened a little so there isn’t too much juice that will just end up curdling your cream. Then add a layer of Macaroons. Crumble and crunch those little suckers up and sprinkle them over the fruit. Repeat this sequence until your bowl is full or you’ve run out of ingredients. Save a layer of cream and a sprinkle of Macaroon crumbs on the top. The Mess will start out with chewy crunchy bits and the longer it’s left they will melt into a marshmellowy sticky ribbon of pretty colour. Have fun with your colour, flavour and fruit combinations. My family have given it the definite thumbs up. Printables shown in the photos are available from our Etsy shop. 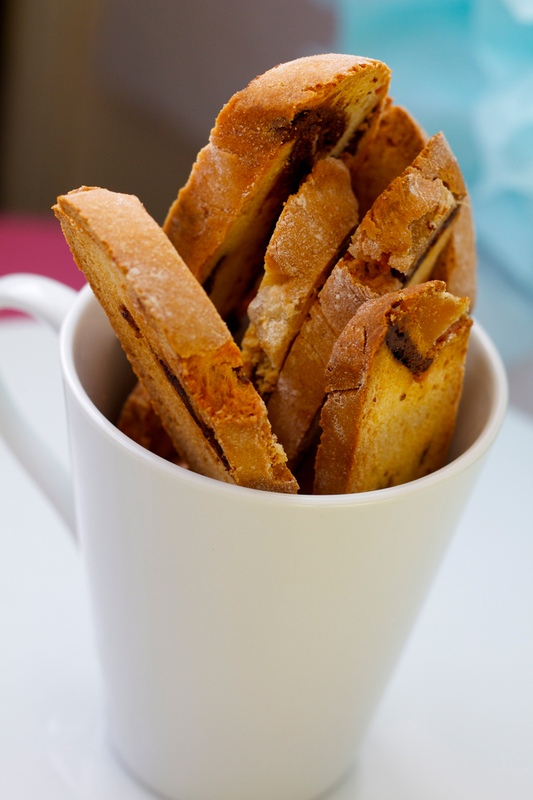 Biscotti makes a great gift, it’s easy to make, goes a long way and keeps well. My biscotti recipe has ginger and dark chocolate, one of my favourite combos. Sift flour and baking power together and mix in chopped ginger, ground almonds and chocolate. Whisk together eggs, sugar and vanilla essence. Make a well in the centre of the dry ingredients and poor in the egg mixture and mix till combined. The dough will be quite wet so tip out onto a lightly floured and divide in two. Roll the two sections into long sausage shapes about two inches wide and 12 inches long. If the mixture is really sticky you can use cling film to help roll the dough into shape. Put the two logs of dough onto a cookie sheet lined with baking paper with a little room between each to allow for some spreading. Bake for 25 minutes. When cooked allow the logs to cool completely before cutting. Once cool cut into .18 inch thick slices diagonally down the log. I found using a serrated bread knife using very little pressure, just letting the knife do most of the work gave the smoothest most event biscotti. Place the sliced biscotti back onto the cookie sheet in a single layer and cook for a further 15 mins. Keep a close eye on them to make sure they don’t over brown. Cool on a wire rack.